Sei Kakuen was born in Shanghai, China in 1945. Master Sei started Chi Kong from 5 years old influenced by the grandfather who had been training Shaolin Kanfu (少林功夫). And then, he started learning Chi Kong seriously from 10 years old. 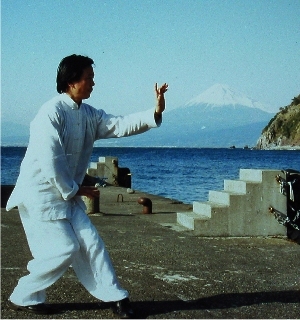 Learned Tai Chi Kong（太極拳）, Shin I Kong（心意拳）, Shaolin Kong（少林拳）and Tough Chi Kong (硬気功=鉄衣布衫功 Iron Shirt Chi Kong）and Gentle Chi Kong(軟気功). Graduated from Shanghai Medical School（上海市衛生学校医士班） and worked as Psychiatrist (Western Medicine) for 16 years at Shanghai Medical Health Center（上海市精神衛生センター）. While working as a Psychiatrist, he was also trained at Shanghai First Medical School of Neurology Kazan Hospital （第一医学院華山医院脳内科）and Shanghai Kato Normal University in Psychology（上海市華東師範大学心理系）. He continued training Chi Kong while working. Since 1980, he worked as an editor and writer of the “Shanghai Public Health News（『上海大衆衛生報』）” of WHO Health Education and medical News Publisher(ＷＨＯ衛生教育医学新聞社) for seven years. There was a big boom of Chi Kong in China then, so he had opportunities to visit many famous masters of Chi Kong all over China and directly learned their secret methods. Names of masters are蘇根生（Master of八宝金剛）、林泉宝（Senior master of 蔵文義）、陸継業（Pupil of 孫祿堂）、秦仲宝（Pupil of 侠拳名人傳再仙）、黄仁忠（Pupil of 曲阿水, Master of 一指禅）、梁上元（Last pupil of 盧嵩高）、張桂生（Master of 韋駄気功）、潘学固（Calligrapher, Chi Kong Calligraphy）、羅錫基（一指禅）、徐華、馮樹新、王桃雲（Secret Police of 杜月笙）、張金発（佛家気功）、李蓮華（香功・Pupil of 田瑞生 in Shanghai）、姜立中、全関良 and others. Pursue to obtain various Chi Kong such as 佛家・八宝金剛気功、佛家・神筆功（判官筆）、武家・鉄衣布衫功、武家・返還功、佛家・韋駄気功、明目功、佛家・香功、道家・龍門流周天功. He became a member of Shanghai Chi Kong Science Academy since 1983. Came under spotlight in 1984, performed Chi Kong calligraphy demonstration at the Shanghai Gymnastic Hall collected approximately 3000 people. The spectacular was shown via Shanghai Broadcasting Television and Shanghai Chi Kong Science Academy and program was repeatedly shown in China. He had performed Chi Kong calligraphy demonstration in many of the official events and also performed at Japan-China Youth Event. He was invited by Japanese healthcare experts to perform Chi Kong calligraphy and came to Japan in August 1987. He has been teaching Secret Chi Kong in Japan since then. Visited United States, responded the invitation of Los Angels Chi Kong Association in 1991. Visited France in 1993, 1994 and 2003 invited by French medical group. Interviewed by French TV channel and EC TV channel and program was broadcasted in France and Germany. 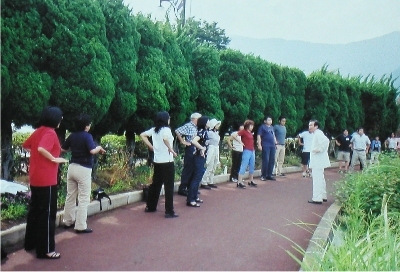 He held a lecture of “Human Science of Eastern Medicine” at Waseda University, Human Science Dept. in May 1993 in Japan. Presently, he commits himself to disperse Secret Chi Kong in many cities in Japan and overseas by holding Chi Kong workshop and classes. There are many fans of Master Sei in sporting world and entertainment scenes. Member of Shanghai Psychological Association, as a Doctor.